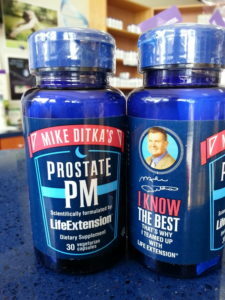 Get prostate relief today & better sleep tonight! As a player and coach, Mike Ditka has always demanded the best. That’s why he teamed up with Life Extension®. For 36 years, Life Extension has been helping people stay healthy and live better. They offer the best nutritional supplements because they have the toughest standards. Just like Coach Ditka. Prostate issues can develop as early as your 40’s, and most men have some kind of prostate problem by the time they’re 50. And as those guys can tell you, poor prostate health can lead to sleepless nights. You wake up all night long to go … and then you can’t get back to sleep. But not with ProstatePM. Pygeum bark extract & Beta-sitosterol: Two unique ingredients that help reduce nighttime frequency of urination — especially for guys with aging prostates. Lycopene: From Tomat-O-Red® extract. Lycopene is a powerful nutrient for prostate health, helping to protect your prostate at the cellular level. Boron: Boron is a little-known trace element clinically shown to promote healthy prostate tissue. Melatonin: Non-habit forming melatonin encourages healthy, natural, and restful sleep. ProstatePM tackles prostate health head-on, with sound science and clinically validated ingredients. It is one of the only once-a-day nutritional supplements formulated specifically to support prostate health, promote healthy urination patterns, and help you get a good night’s rest. Always FREE shipping for any order over $25 in the continental U.S.
How many pills per day ? What is the actual amount of beta sitosterol in each pill ? Thank you. Serving Size 1 vegetarian capsule; Take one (1) capsule daily, 60 minutes before bedtime, or as recommended by a healthcare practitioner.